Meteor showers occur when dust or particles from asteroids or comets enter Earth's atmosphere at very high speed. When they hit the atmosphere, meteors rub against air particles and create friction, heating the meteors. The heat vaporizes most meteors, creating what we call shooting stars. What you’re seeing is not smoke, or burning particles. As a meteoroid (the actual solid chunk of material) blasts through the atmosphere, it violently compresses the air, heating it up hugely (note this isn’t due to friction, but compression; like when a bicycle pump heats up as you use it). The heat is so intense it ionizes the gases, stripping electrons from their parent atoms. As the electrons slowly recombine with the atoms, they emit light—this is how neon signs glow, as well as giant star-forming nebulae in space. Basically, the supersonic object creates its own oven by compressing the air in front of it. Furthermore, if the object is made of an oxidizable material (such as iron, aluminum, or carbon) and the air is oxygen rich (such as the earth's atmosphere), then the object may quite literally burn up. So the next time somebody tries to tell you that air friction causes a meteorite to burn up in the atmosphere, be sure to correct them and tell them all about supersonic shock. If you look at what happens when the space shuttle passes through the atmosphere, the atmosphere is not compressed overall, just heated. So overall the energy loss is through friction. On the way, however, a bit of energy is stored in compressed air before getting lost via friction in the air as it re-expands. With the meteor moving at this speed, there is a lot of heat generated (compression, as well as friction/viscosity). To me compression makes much more sense intuitively (but I might be wrong). But then at the same time, I am lacking the actual physics knowledge to demonstrate it myself. Here on SE Physics are some great answers on similar topics but they don't quite answer my questions. Maybe my questions cannot not as easily be answered, which would still be a valuable answer to me! Q1: Taking an ideal object as an example (e.g. spherical, 1 m radius), which enters the earth's atmosphere, is it possible to roughly calculate the total amount of heat generated at a given height, and then quantify the amount of heat due to compression vs. friction? Say 80% compression and 20% friction (or 99% vs. 1%, or similar)? A ballpark figure would totally suffice! Q2: With respect to the second last example/quote above, is there technically a difference if a metoroide or the space shuttle enters the thicker layers of earth's atmosphere (i.e. friction for the space shuttle example and not compression)? Pieces of stone or metal falling from space, made visible for part of their journey due to intense frictional heating. Imagine a blunt object like a space-capsule entering the atmosphere. It experiences a decelerating force, right? If you divide this force by the surface area of the blunt front facing surface, we get an effective pressure. The atmosphere has to create this pressure in front of the object, otherwise there would be no force (a molecule streaming by the sides of the object without hitting it can't create such a force). This compression also heats the gas in front of the object. The hot, dense gas now streams along the sides of the capsule. If we want to keep the capsule cool, then we certainly don't want this hot gas to touch the body again, which is why capsules are entering with the broad side and are not flying like planes with a sharp nose cone. The body angle has to be small enough that the gas can pass the entire body before it expands enough to reach the walls. The majority of the kinetic energy in the capsule will be converted to heating of gas in this bow shock, only a fraction of it will be absorbed by heat shield and an ever smaller amount will heat the backside walls. 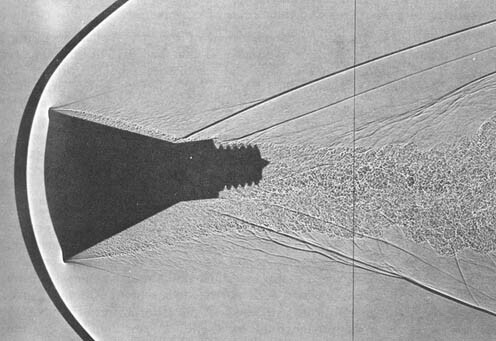 Without this phenomenon re-reentry would be an even harder thermal problem than it already is. Not the answer you're looking for? Browse other questions tagged thermodynamics friction atmospheric-science meteors or ask your own question. After what speed air friction starts to heat up an object? Is the total mass of Earth's atmosphere essentially constant in time? At what wind speed does wind chill's conductive cooling exactly cancel out the compressive heating of the air? Why do meteors heat up when they fall through the atmosphere? Why Jet fighters don't heat up like spacecrafts? At which speed an object becomes hotter as it travels through the air? What is the contribution of conductive heating to atmospheric warming?